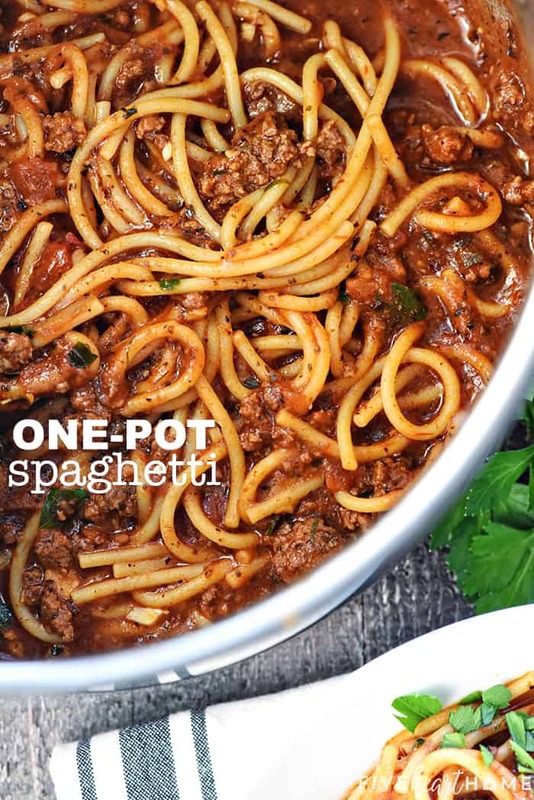 One Pot Spaghetti is quick, easy, and delicious, with only one pot to wash for a family-pleasing dinner…you’ll never make regular spaghetti again! 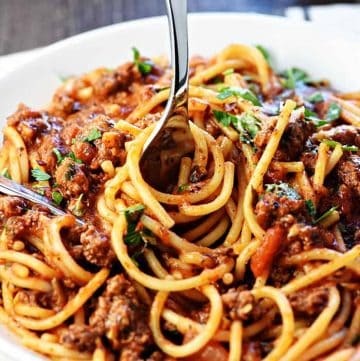 Spaghetti is just one of those classic dinner recipes that most people undoubtedly have on their regular menu rotation. I’m a proud member of that club, because it also happens to be a meal that every member of my family will eat without complaint. I mean, who doesn’t love pasta and meat sauce? Since the dawn of time, I would always make my spaghetti the same way…AKA, the “normal” way. 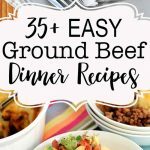 I would brown my ground beef and stir in my sauce, whether homemade or from a jar. In a separate pot, I would bring salted water to a boil and add the noodles. Then I’d pull out a colander to drain the pasta and hope that I could keep it from getting cold or drying out before serving. 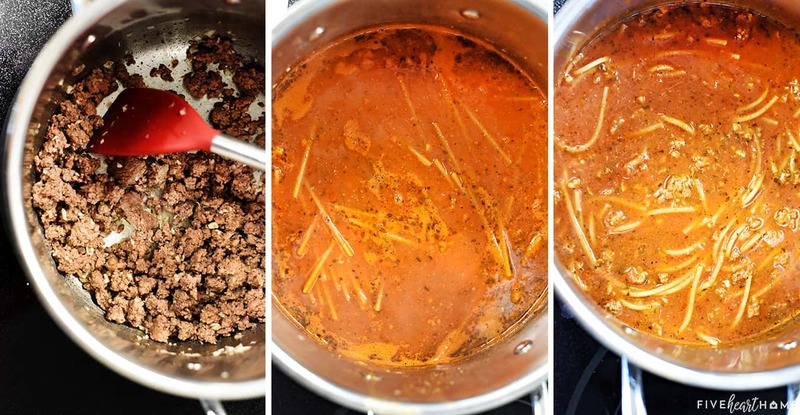 That’s right, folks…you can cook your meat sauce and your pasta in JUST ONE POT. At the end, there’s nothing to drain and no stuck-together, dried-out noodles. There ends up being only one pot to wash, rather than two pots and a colander. 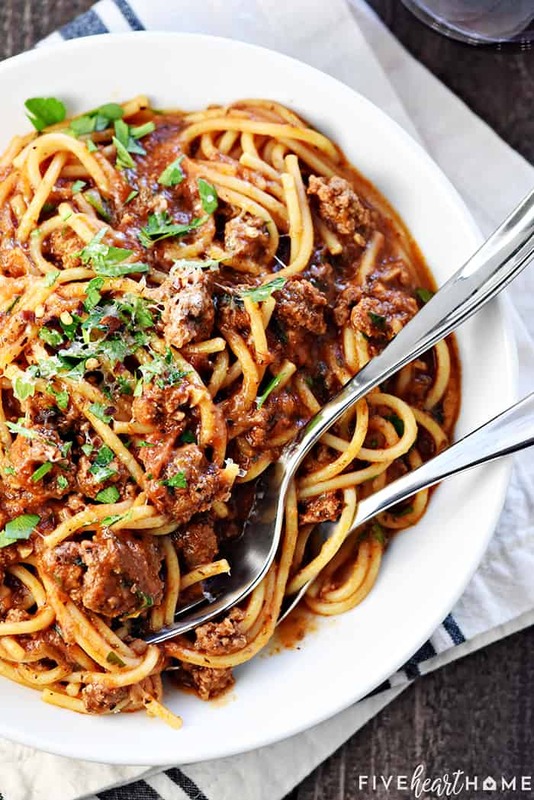 And best of all, cooking everything together in the same pot on the stove yields the creamiest, most flavorful spaghetti! Brown the ground meat. I typically use lean ground beef, but feel free to substitute crumbled Italian sausage for half of the ground beef. Or you could choose to use ground turkey instead. Add the sauce. I feel no shame in using a good-quality jarred marinara sauce when I make spaghetti. I always check the label to make sure it contains only real ingredients, and then I jazz it up with extra herbs and seasonings. Also, since this is designed to be a quick-cooking recipe, the flavors in the sauce aren’t going to have as long to develop and marry, so I think starting with store-bought marinara starts the recipe with a good base flavor. Stir in broth. 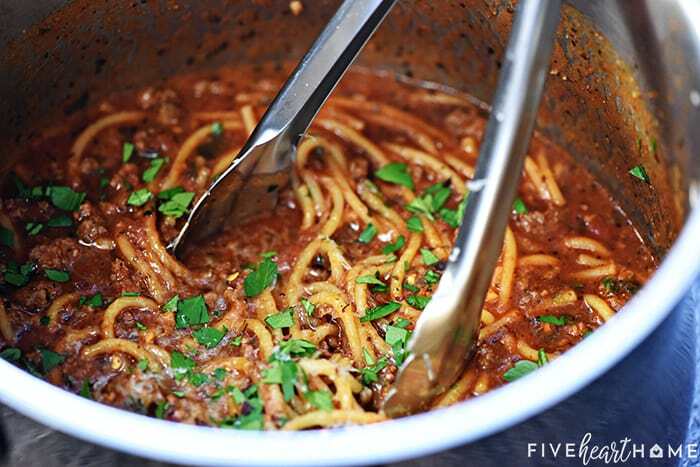 You’ll need to add extra liquid to your pot since the noodles are going to be cooking directly in the meatsauce. After the broth has been mixed in, bring your watery sauce to a boil and then reduce the heat. Add the spaghetti noodles. Be sure to criss-cross and separate your pasta so that it doesn’t initially stick together in one big lump. And push it down into the sauce, making sure it’s all covered by liquid without actually stirring it in. Cover and cook. The total cooking time should be 15 to 20 minutes. Don’t forget to stir every 5 minutes! 6. Garnish and enjoy! Pile it on a plate, shower it with freshly grated Parmesan, fresh minced parsley, and — if you like to live on the wild side — crushed red pepper flakes. Dinner is served! And y’all, THAT’S IT. I’m not gonna lie…this is the only way I ever make spaghetti anymore. It saves time and effort AND it turns out really tasty! Because what more can you ask of a classic, improved dinner recipe than that?! 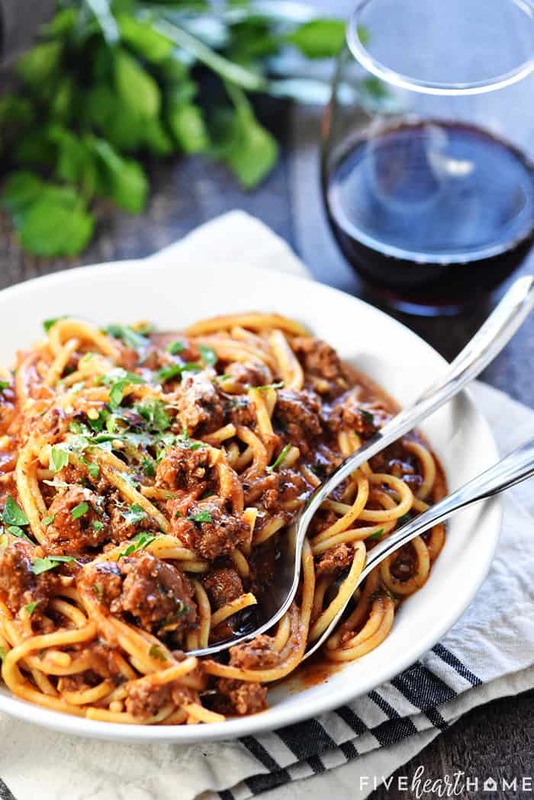 If you enjoy onion in your spaghetti, you may start out the recipe by cooking 1 cup of diced onion in a tablespoon or two of oil for 5 minutes or until tender. Then add the beef to the pot and proceed with the recipe. As previously mentioned, I like adding extra ingredients to my store-bought marinara for a boost of flavor. 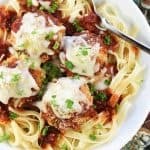 However, if you wish to make this recipe with a regular ol’ jar of spaghetti sauce or marinara and NO extra herbs/spices/flavorings, your meal will still turn out just dandy. On the other hand, if you’d like to swap crushed tomatoes for jarred marinara sauce, feel free to do so. I recommend doubling the tomato paste and the balsamic vinegar, tasting the sauce, and then adjusting the dried herbs and seasonings as desired, since crushed tomatoes are not already seasoned. 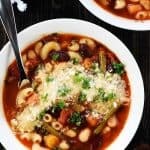 Also, I’d allow the sauce to cook for a few minutes — thereby allowing the flavors to develop — before stirring in the broth and the pasta and proceeding with the recipe. I mix some Better Than Bouillon beef base into water for the extra liquid in this recipe. You could use real beef broth instead. Or even chicken broth. Or even water. 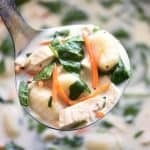 I just think using broth instead of water gives this recipe a deeper flavor. I actually swirl the broth around my empty marinara jar before dumping it into the pot to make sure I get every last bit of sauce! You can use two teaspoons of an Italian Seasoning herb blend in place of the individual dried herbs. If necessary, adding a bit of sugar to the sauce will cut the acidity of the tomatoes. 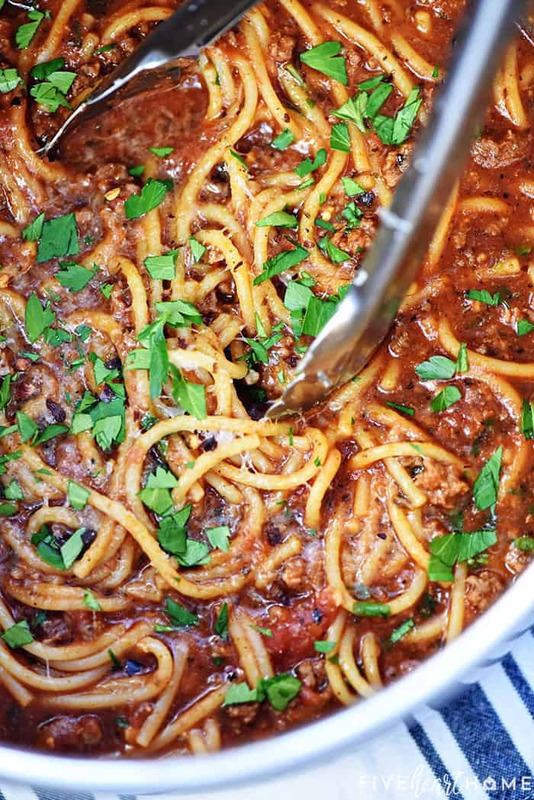 Spaghetti gets a makeover with this quick, easy, delicious One-Pot Spaghetti! 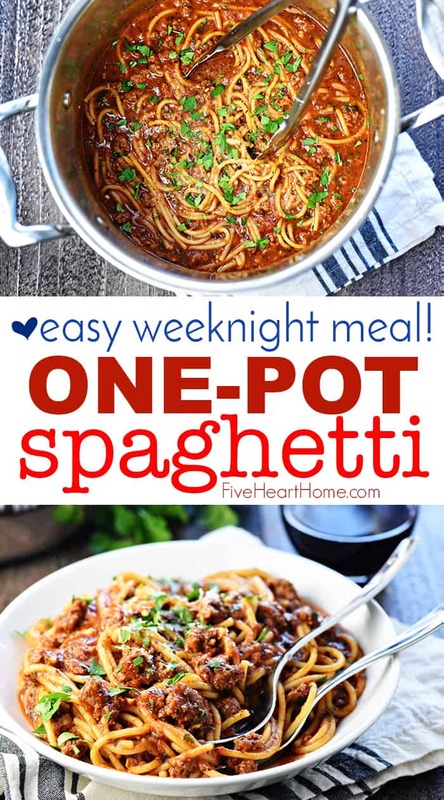 Made in just one pot, it's a family-pleasing dinner for busy weeknights! Set a large pot or Dutch oven over medium-high heat. Add the ground beef and cook until no longer pink, breaking apart and stirring as the meat cooks. Stir in the minced garlic and cook for another minute or two until fragrant. Drain the grease from the pot and season the beef with salt and pepper, to taste. Add the marinara sauce, tomato paste, balsamic vinegar, dried basil, dried oregano, dried thyme, sugar (if using), and beef broth. Stir well to combine, bring to a boil, and then reduce heat to a low simmer (about medium-low). Lay the broken spaghetti noodles on top of the sauce, criss-crossing them and pressing them down until submerged by liquid. Do not stir at this point. Cover and cook, stirring every 5 minutes, until the excess liquid is absorbed and the pasta is al dente, about 15 to 20 minutes total (see NOTES below). Stir well and serve immediately, topped with plenty of Parmesan cheese. If your sauce is still too watery by the time your pasta is done cooking, take the lid off and cook uncovered for the last few minutes. This will allow excess liquid to evaporate. I cooked this particular batch of One-Pot Spaghetti for 15 minutes covered and 2 minutes uncovered. On the other hand, if your pasta isn't cooked through by the time all of the excess liquid in the sauce has evaporated, stir in a bit more water and continue cooking until the noodles are nice and al dente. If you'd like to use whole wheat or gluten-free spaghetti in place of regular white pasta, just be prepared to adjust the cooking time and/or liquid, as described above. 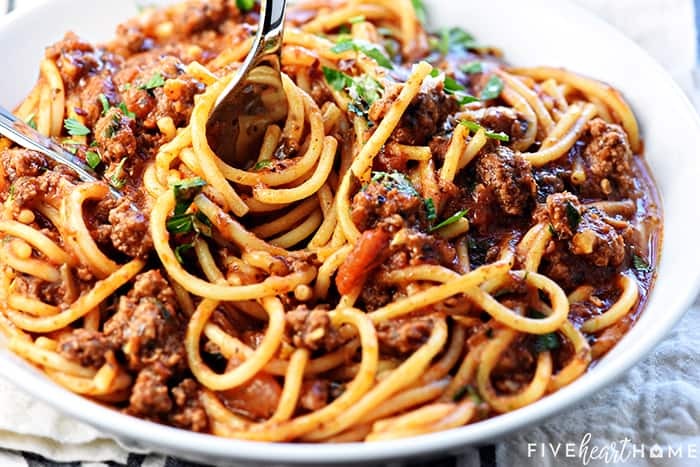 This is a step up from regular spaghetti and it is so so good! Everyone needs a shortcut now and then! I hate doing dishes and I love that this recipe cuts them down. Thank you for the onion tip – that’s our favorite. It’s really good, Rose Mary…I hope you have a chance to try it soon! We cooked this today for lunch and it was great!